At 15 years old, Claire Shriner, a nursing major, underwent surgery after tearing her anterior cruciate ligament (ACL). It was her first time in a hospital. She chatted with the nurses, surgeons, and the anesthesiologist and left the hospital eager to learn more about the health care field. Initially, Claire thought she might want to become a surgical nurse. Confirmation of this career choice came soon afterward through job shadowing and a high school certified nursing assistant program. Claire admitted her reasoning for wanting to be a surgical nurse comes from two places. First, she finds technological advances to improve surgeries fascinating and excels in her science courses. In fact, Claire commented that her human anatomy course felt like second-nature. Her other reasoning comes from when she was younger. She used to feel uncomfortable talking to people she didn’t know, “and if I was working in an operating room, my patients would be unconscious.” Now, she said her communication skills have greatly improved, which she credits to nursing school. If you’re unaware, getting into the nursing program is highly competitive. For perspective, roughly 500 students declare pre-nursing as their major each fall, and close to 200 students apply each semester. Out of those 200, only 90 are admitted. Helping people is always something I’ve done and enjoyed. Upon her first time applying, Claire found herself empathizing with the 55% of students who don’t receive admittance. When this happens, it’s important to meet with an advisor. Students have to know if they’re competitive for their program, and advisors can provide that feedback. If the student is not, the advisor can assist in creating parallel plans to ensure the student doesn’t fall behind academically. 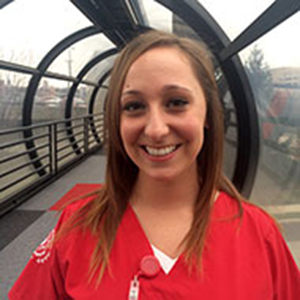 For Claire, she was always open to exploring other options, but wanted to reapply to nursing school. After retaking a few classes and resubmitting her application, Claire was accepted to the Indiana University School of Nursing. Currently, she’s considering furthering her schooling to become a nurse practitioner. Claire explained, “Helping people is always something I’ve done and enjoyed.” For this reason, she hopes to one day incorporate teaching into her career by helping her patients better understand their health and how to prevent further illness.